Six Of Pentacles. Tarot. Free Tarot. Free Tarot Reading. 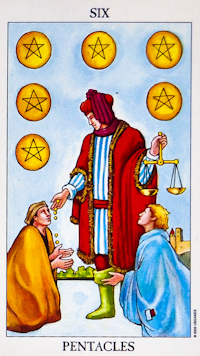 The central figure holding the scales is the benefactor, as indicated by the master number and the area of the zodiac's relationship. The key pictures the condition when values are learned, and the material substances of life are shared. The other figures depict the opposite condition, when the positive side is neglected, and the negative condition (objects of charity) results from carelessness. You can choose to create a positive or the negative in your own future.